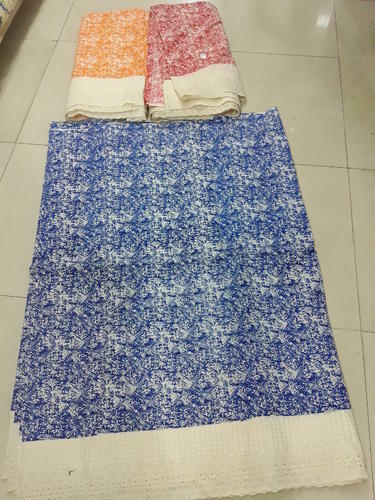 Its a cotton embroidery fabrics use for making ladies kurtis and plazzos .Good quality fabric and 48' inches width. Incepted since 1999, Nandi Fabrics has evolved as one of the leading organizations engaged in manufacturing, supplying, trading and wholesaling of comprehensive range of Cotton, Rayon and many other designer fabrics . Our collection of Cambric Print Fabric and Cotton Prints Fabric are considered acme of fashion and cater to the needs of changing market scenario. We put forward very good quality as well as competitive price that gratify the needs of our clients. Under the brand name Nandi; our collection is available in vivacious colors, eye catchy prints and innumerable variations that add grace and elegance. Moreover, our customer-centric as well as quality-focused business policies have been enabled us to muster many esteemed clients in this competitive market. We are known in the industry for long-term and mutually beneficial relationships which is the reason behind our huge clientele base. We take pride in having the best and sound infrastructure with most prominently, best people in the industry that equips us to design highly anticipated products. We believe that in today’s competitive and liberalized business environment quality is the key to success and survival. We continually update ourselves with the latest machines and manufacturing facilities. At the core of our quality products lies the application of streamlined business processes, strategic planning, and hard working task force. Backed by all these strengths, we are able to satisfy widely varying demands of customers and deliver consignments within the promised time frame.